This work consists of an acrylic and airbrush double-sided mural depicting Chicano figures and symbolism on a backdrop of swirling colors. 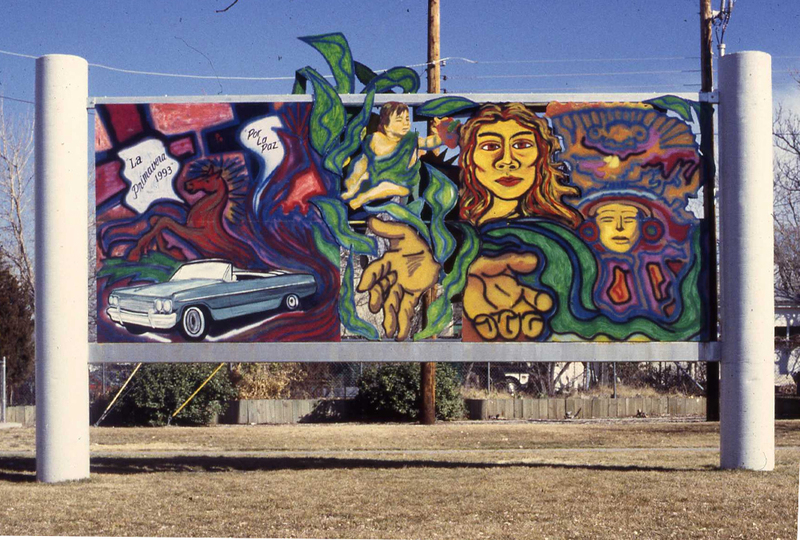 Measuring 20’ x 8’, the sculptural mural was planned and executed by three artists working with selected Albuquerque Youth. One side of the mural exemplifies traditional techniques and the other side, aerosol art techniques. It was originally proposed to be located at the Piedra Lisa Dam site, but community opposition caused the design to be relocated. The original mural was painted in 1993 with Michael LeFebre as the lead artist, and the newer one in 2013 with Michael Ipiotis as the lead artist. Michael Ipiotis re-painted it as traditional New Mexican folk art with subway train painting to expand on the restoration work. Francisco LeFebre is an artist who has painted many murals in and around Albuquerque, New Mexico. LeFebre, along with fellow artists Bernadette Rodriguez, Irene Oliver Lewis, and musicians Jesús "Chuy" Martinez and Lenore Armijo, founded El Centro Cultural de Nuevo México. He has a personal history of the development of Chicano muralism in northern New Mexico, including influences from Mexican muralists José Clemente Orozco, Diego Rivera, and David Alfaro Siqueiros, as well as the early collaborative efforts of Chicano painters in Santa Fe to form in 1970 the seminal group Los Muralistas Guadalupanos de Aztlan. His focus of work is highly regarded in such a neglected geographic area within the history of Chicano muralism. LeFebre proclaims the mural as the ideal art form and expresses his expectations that the young Chicano mural movement will continue to develop. He details the inception of Chicano muralism in New Mexico, citing the influential participation of Los Muralistas Guadalupanos de Aztlan, as well as the development of mural projects in strategic locations throughout the state, including universities, churches, and other public buildings. Michael Ipiotis (aka Mike 360) is from Albuquerque. He is a public artist, poet, farmer and musician. Since 1992, he has created murals integrating traditional mural techniques with the use of spray paint and other ultra-modern media. Mike apprenticed with El Salvador’s Camilo Minero and is also a student of grand master aerosol artists Phase 2, Coco 144 and Vulcan.